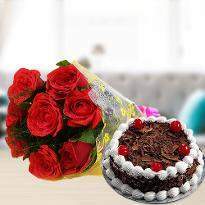 People of Ghaziabad celebrate most of the time in organizing these events with great zest.They never forget to order Online flower and cake as these two items rock the event. Sweetness, fragrance, enjoyment, romance, love, happiness, adventure are parts of human life. 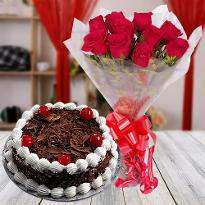 Cakes spread sweetness, enjoyment, happiness in your life whereas Flowers bring love, romance, positivity in your life. 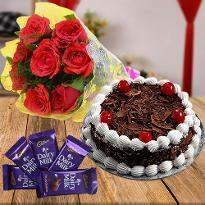 To make your life more delightful order Online cake and flowers delivery in Ghaziabad via winni.in. 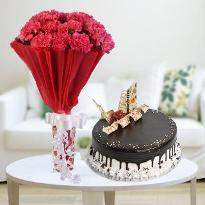 We have different varieties of cakes and flowers based on events and occasions. 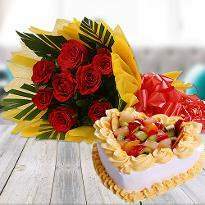 There are many occasions where different type of cakes and flowers are ordered by customers. If it is children party or first birthday of your toddler then we have the variety of drawing cakes and shape cakes variety. 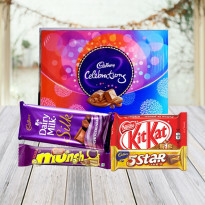 Customization option is there where you can provide the themed photo, according to your choice we will prepare the cake. 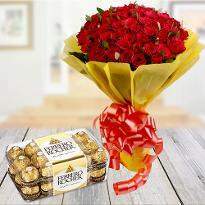 Flowers are the most relieving thing which provides happiness to the people who know the aroma of flowers. The fragrance of flowers and the scenic beauty refreshes up the aroma and energizes the moment for the new mindset of the people of Ghaziabad. 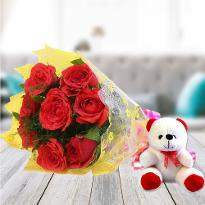 Online Flower bouquet delivery in Ghaziabad is not a new concept and is delivered with enthusiasm and eagerness. Love for the flower is popular among the couples. They express their feelings to each other by giving flowers to each other. 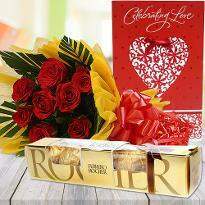 We provide online flower delivery. You can easily select flowers from wide collections available here. You can also choose flowers according to your types like roses, carnations, gerberas, lilies, orchids. 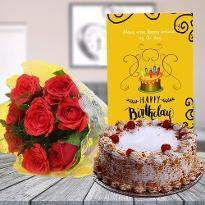 A wide range of flowers at affordable prices are also available here for every occasion like Anniversary, Birthday, Appreciation, Friendship day, Get Well Soon, I Am Sorry, Love And Affection.The love for cake exists since ages.Every occasion is celebrated by adding cake as a primary ingredient. 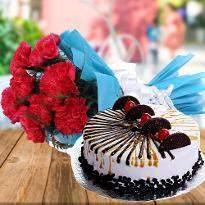 We provide different varieties of cakes for different occasions. 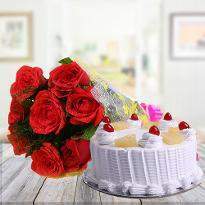 Anniversary cakes: We have a separate category for Anniversary cakes like Heart shaped cakes, romantic cakes. We offer specially designed cakes with photos of Couples and Married partners. Like you can choose photo cakes flavor to make your cake look dramatic. 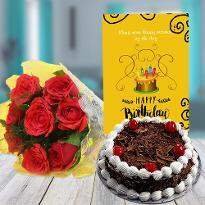 Birthday Cakes: We provide lots of variety of birthday cakes like choco truffle cake, Black forest cake, Irish coffee cake, vanilla cake, chocolate cake, chocolate truffle cake etc. 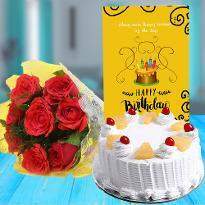 You can send birthday cakes for parents, wife, brother, sister, husband, friends.We also provide the eggless cake for pure vegetarians. Appreciation Cakes: A cake for your employee who has performed excellently in the company. 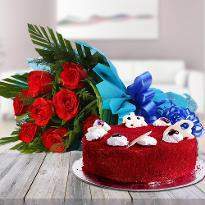 To appreciate his performance order cake online in Ghaziabad to bring innovation and happiness on his face. 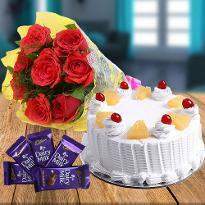 We provide eggless cake delivery in Ghaziabad to sweeten the taste bud of people residing in this beautiful city. People of Ghaziabad love to celebrate their birthday at midnight. 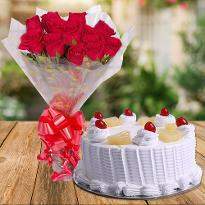 Blowing of candles and cutting of cake in midnight is good starting of your birthday. Midnight surprises are the best surprises. 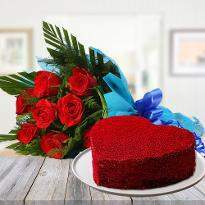 A heart shape cake and flower to win the heart of your sweetheart is served by us. 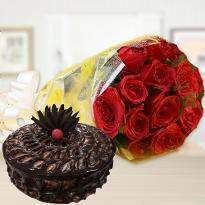 Surprise your loved one with midnight cake and flowers delivery in Ghaziabad. 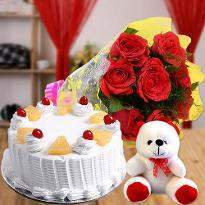 We provide different type of designer cakes like Mickey mouse cake, Doll cake, camera cake, car shape cake, teddy shape cake and much more. 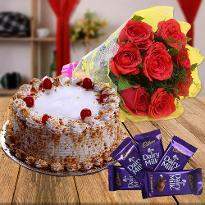 Winni has established itself as number one trustworthy company when it comes to online cake and flower delivery across India. Winni is working with an aim to make the bond stronger between people. 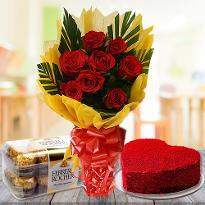 Can I send my Personalized Message along with flowers and cakes? The answer is yes!!! 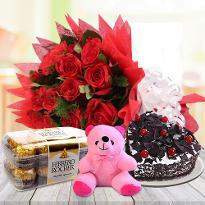 !A personalized message along with flower and cake conveys your true emotions. Hence we offer personalization facilities for the customer those who want to send combo for their loved one.While placing the order you can see a column of personalization, put your message there. We will deliver your order with your beautiful message to the recipient. 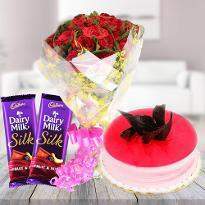 Can we also have cake delivery in Ghaziabad along with flowers? 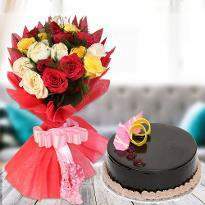 A combo of cake and flowers delivery is the best combination ever. the best combo for your soulmate.we harbor all kinds of flavors of cake, whether it is chocolate cake, black forest, red velvet, banana cake etc. similarly, when it comes to flowers, from beautiful vases and bouquets that include never ending varieties- from a combo of roses to a mixture of other flowers. Roses, carnations, gerberas, lilies, orchids, every variety is present here. Chander Nagar, Chaudhary More, Dabur Chowk, DLF Ankur Vihar, Govindpuram, Gyan Khand, Hapur, Indraprastha Yojna,Ramprastha Greens, Sector 1 Vaishali,Sector 11 Vasundhara, Sector 14 Vaishali, Sector 16 Vasundhara, Sector 18 Vasundhara,Sector 2 Vaishali, Sector 2B Vasundhara, Sector 3 Vaishali, Sector 3 Vasundhara, Sector 4 Vaishali, Sector 4 Vasundhara, Sector 5 Vaishali, Sector 5 Vasundhara, Sector 6 Vasundhara, Sector 9 Vaishali, Sector 9 Vasundhara, Shakti Khand, Shastri Nagar, Raj Nagar Extension, Crossing Republic, Lal Kuan, Abhay Khand, Dasna,Shipra Suncity, Vaibhav Khand, Ahinsa Khand 1, Ahinsa Khand 2,Kinauni Village,Tronica City, Kamla Nehru Nagar, Nehru Nagar 2, Rasulpur Sikroda, Sector 10 Vasundhara, Sector 14 Vasundhara, Sector 15 Vasundhara, Maharaja Agarsain chowk Masuri, Modinagar, Muradnagar, Neelmani Colony, Nehru Nagar 3, Niti Khand, Nyay Khand, Pasaunda, Pilkhuwa, Pratap Vihar, Raj Bagh, Rajendra Nagar.